The best gifts are homemade — especially when it comes to food. Skip the shopping and head to the kitchen to make these easy DIY edible holiday gifts everyone on your list will love! Use ice cube trays or muffin tins to create these easy hot chocolate spoons. To make, place 2 cups of semi-sweet chocolate chips in a microwave-safe bowl. Microwave in 30 second intervals, stirring in between, until the chocolate is completely melted and smooth. Divide the melted chocolate between molds and top with mini marshmallows or crushed peppermint candies. Insert a plastic spoon in the middle of each compartment and place in freezer 20 minutes, or until completely set. Place chocolate spoons in cellophane bags and attach a label instructing recipient to enjoy by stirring into a mug of hot milk. Divide a batch of your favorite store-bought hot cocoa mix into cellophane cones (available at Crafts stores or online). Fill 2/3 of the way with cocoa mix, then top with a handful of mini marshmallows. Seal the bags shut with brown pipe cleaners twisted into antler shapes. Decorate the bags with googly eyes and red pom pom noses. Spread a sleeve of saltines on a parchment-lined baking sheet. Top with melted white chocolate and crushed candy canes. Sprinkle with a pinch of kosher salt or coarse sea salt. Let cool in refrigerator, then break into pieces and package in gift bags or small cookie tins. These sand-art-style slow cooker meals in a jar are a great gift for those on your list who love to meal prep, or anyone who needs a quick and easy healthy meal every now and then (so, everyone, really!). 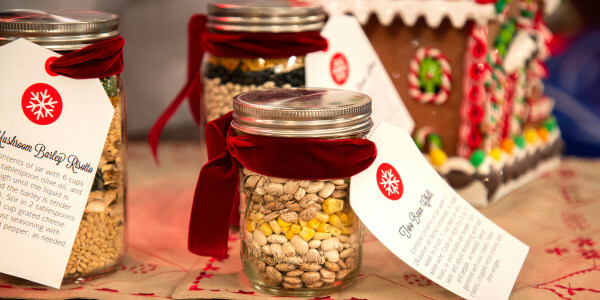 To make, you simply layer all the ingredients in a jar and attach a recipe card with cooking directions. Use these recipes as inspiration and feel free to swap in your own favorite beans and dehydrated vegetables, or adjust the spice levels to your liking. Note that kidney beans are not recommended for slow cookers without soaking first as they can cause digestive issues, but all others are fair game! Prefer a meatier dish? Add ground meat, chicken thighs or any kind of stew meat to your slow cooker along with the jar. The only thing better than Christmas movies? Christmas movie snacks! This ridiculously adorable salty-sweet Reindeer Popcorn is the perfect gift for the Hallmark movie fan in your life. To make, pop 10 cups of popcorn in an air popper and season with salt. Melt 1/2 cup butter and 6 cups of mini marshmallows in a large pot over low heat then add to popcorn and stir until evenly coated. Spread onto a baking sheet and decorate small handfuls of sweetened popcorn with candy googly eyes, red M&M's, and chocolate-covered pretzel antlers (break pretzels in half to make antlers). Let cool completely and serve or package into wax paper-lined gift tins.